Bhumi Thapa is 16 years old. She is bright, beautiful and optimistic. As a young child, Bhumi left her home village in Nepal’s mid-west hilly region to find better support services for her Muscular Dystrophy in Kathmandu. For the past 11 years, she has been living at Olgapuri Children’s Village, run by Nepal Youth Foundation. Bhumi first came across CIL-Kathmandu in 2017, when she needed some repairs for her wheelchair. It was during this first visit that Bhumi learned about the Independent Living Program and other services offered by CIL-Kathmandu. One year later, Bhumi returned to CIL-Kathmandu to participate in a four day Independent Living Program. During her program, Bhumi stayed at the office in Ratopul and participated in peer counselling and office activities. However, it was the social activities on Day 2 that she enjoyed most about the program. 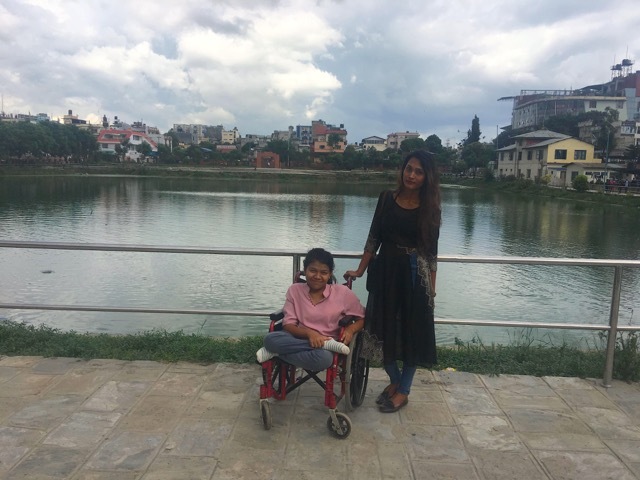 With the support of personal attendants, Bhumi watched a film at the cinemas, ate lunch at the food court and then visited Kamal Pokhari and Pashupatinath. It was her first visit to the holy cremation site and a very special experience. “It was very beautiful and I was happy to find it was mostly accessible for my wheelchair,” Bhumi reflects. Two weeks before coming to CIL-Kathmandu to participate in the Independent Living Program, Bhumi enrolled for +2 classes at Padma Kanya Secondary School. Earlier in 2018, Padma Kanya and CIL-Kathmandu partnered for an Inclusive Education program; installing ramps, an accessible toilet, advocacy murals and conducting disability orientation to staff and students. It is the first time Bhumi has attended an accessible school and the first time Padma Kanya has enrolled a wheelchair user. Both are thrilled to be taking the necessary steps toward creating an inclusive education environment for all students.